In 2014, price/feature wars broke out among the cloud superpowers. In 2015, alpha cloud vendor rivalry is intensifying up and down the stack. New “point cloud” or “anything as a service” (XaaS) startups increasingly see cloud marketplaces as a must-have component of their growth partnering and distribution strategy. From Microsoft to Google to HP to IBM to industry leader AWS, the IaaS (and PaaS) leaders—as well as high growth open source alliances like OpenStack and CloudFoundry—are accelerating their build-out of anything-as-a-service (XaaS) partner ecosystems providing the next generation of cloud application building blocks & enhancement services. At the heart of these rival cloud ecosystems are partner marketplaces — which makes “Quality of Marketplace” or QoM—an increasingly important competitive differentiator for every alpha cloud player on the planet. The AWS Marketplace enables APN partners to directly showcase their XaaS technologies to the AWS customer base. 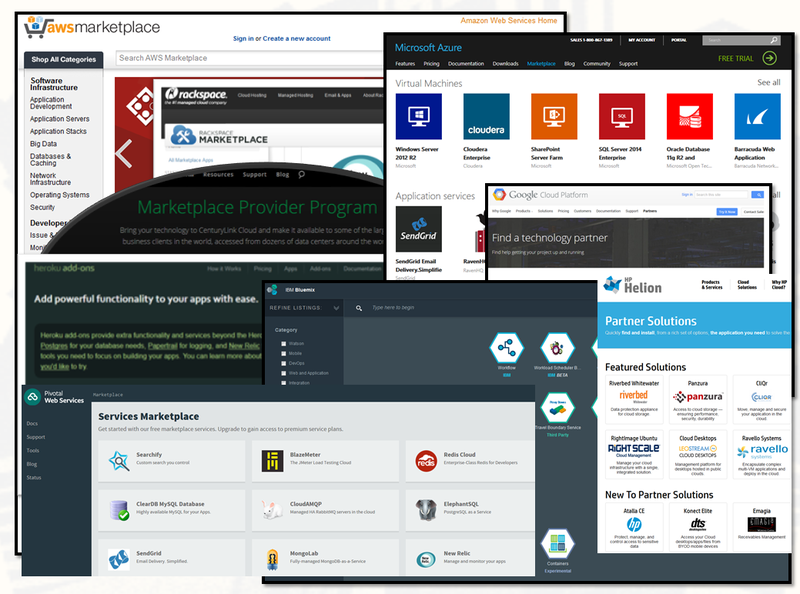 The Marketplace currently hosts more than 2000 partner enhancement products and services including infrastructure, developer tools & business software. When looked at from the standpoint of new breed XaaS startups seeking to drive growth via partnerships with cloud superpowers and alpha vendors—today’s Quality of Marketplace rivalry provides an incredible distribution opportunity. To capitalize on this opportunity, it’s essential that partner-focused growth practitioners & BizDev professionals put QoM on their radar—and then craft and execute their own cloud marketplace participation strategy to capitalize on it. Quality of Marketplace is a multi-dimensional construct that can help you determine and prioritize the relative attractiveness of an alpha cloud vendor’s partnering agenda—and their marketplace fit for your startup. And QoM is not just about developers. Think of QoM as one form of XaaS distribution GPS that can help your team navigate your growth partnering roadmap, revenue plan and resource allocation. Here’s a quick overview of 10 common dimensions or attributes of QoM. QoM is a multi-dimensional construct reflecting the strategic partnering focus & maturity of a given cloud leader’s marketplace agenda. The ‘Quality’ in QoM stems from 10 core attributes or marketplace maturity indicators including: 1-Customer Access, 2-Selection & Mix, 3-Trials, 4-Promotions, 5-Support, 6-Tools, 7-Monetization, 8-Thought Leadership, 9-Multi-Option Deployment, 10-Executive Focus . They are outlined below. It’s important at the outset to make a simple point—that QoM is not about your father’s legacy IT channel partner model. Here’s the major reason why. Cloud marketplaces—by their very nature—enable (and invite) permissioned access to the high visibility enterprise, public sector and startup customers (and reference accounts) of a specific alpha cloud host—-across the entire geographic market footprint of that host. Enterprise software and cloud superpowers like IBM promote their Cloud Marketplace as a growth channel enabling their XaaS and cloud technology partners to access and monetize the IBM global customer base. Every market segment, every geography, every DevOps-ready enterprise powering their digital transformation initiative in a given alpha vendor cloud regularly shop for add-ons, enhancement infrastructure and increasingly—business apps. From a growth partnering standpoint, the cloud marketplace hub represents a complete inversion of the legacy IT channel model. In the legacy model, the question of who owned demand creation—the vendor or the channel partner—could become a point of partnering friction. In the new marketplace model, the cloud marketplace host promotes and helps drive demand to marketplace partners as part of the core experience of that cloud environment. It’s one important reason why go-it-alone “disrupt or be disrupted” thinking can be a false choice for innovative XaaS startups relative to market incumbents. The question becomes this. Why should your growth marketing team think in terms of incumbent disruption—when you can symbiotically align with and piggyback on a pre-existing and proven customer network to grow your business? AWS openly promotes its high profile reference accounts. When it comes to the issue of gaining access to a given cloud customer base, many startups have taken a ‘biggest is best’ approach—and for that reason they put their eggs in the AWS marketplace basket. 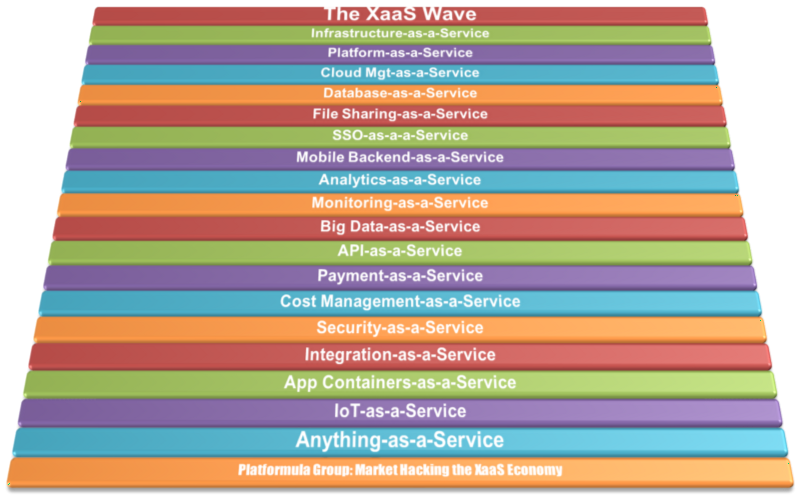 Alternatively, a XaaS startup may think ‘faster is better’—and so to accelerate their overall cloud marketplace participation they choose to outsource their partnering initiatives to a marketplace-as-a-service provider with multi-cloud access. 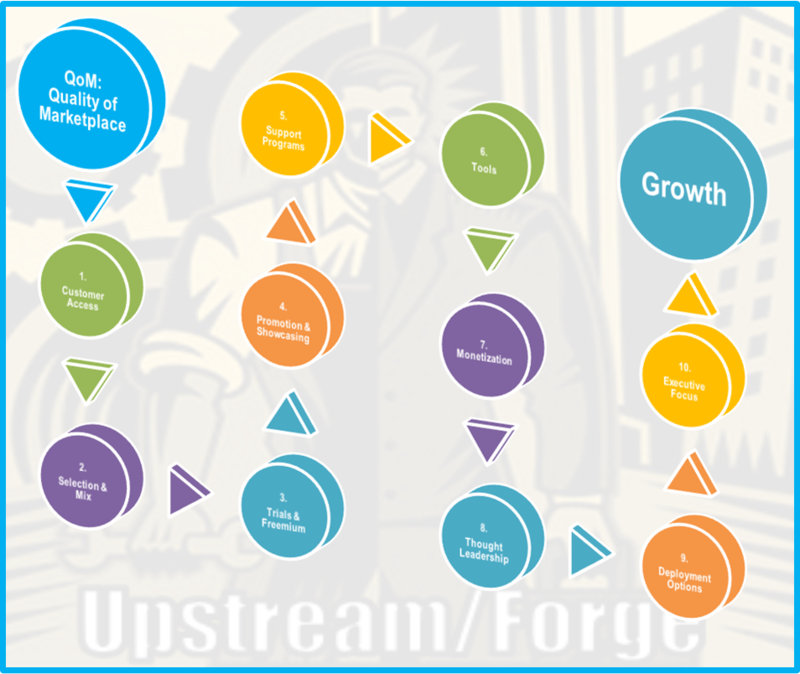 No argument from me on these two growth partnering approaches. Both can and do pay dividends for XaaS startups. But it may also be the case that your startup’s product roadmap and core technology DNA lie elsewhere—e.g. in the IBM, HP, Oracle, Cisco, SAP or other superpower ecosystem. If so, then maybe it’s in your interests to see the Access dimension of QoM from the standpoint of a targeted or niche marketplace strategy. The key to begin capitalizing on QoM rivalry is the idea of Product/Partner Fit—or ‘right customer base access for us’ mindset. 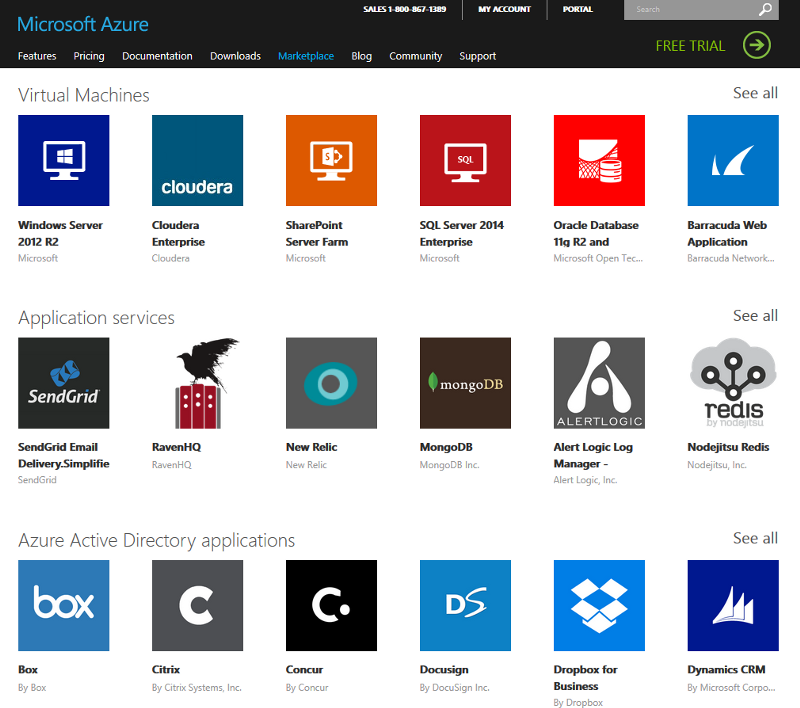 Microsoft’s Azure Marketplace offers more than 500 virtual machine images and add-in XaaS services—on top of thousands of web & Active Directory apps and data services. I define ‘Selection’ as the current state of critical mass of a given marketplace services catalog. I define ‘Mix’ as the ratio of partner products to marketplace host products within a given marketplace. NOTE: On this QoM attribute I call Selection, don’t fall for the ‘First Mover Doesn’t Matter’ mantra now popular among some VCs and tech pundits. The opposite is often true. For example, a marketplace ‘first mover’ like AWS that executes well benefits from increasing returns economics—i.e. the player that gets ahead tends to stay ahead. Practically speaking, this means that to counter AWS in the market, other alpha cloud players will not only have to consciously initiate new campaigns to add more partners—But also to find other QoM dimensions that help them develop marketing counter-measures against AWS (e.g. access to their direct sales team). Selection critical mass also tells you who else is ‘there’ and opens opportunities for you to network or collaborate with relevant XaaS innovators in the marketplace—while gaining insight from them about what works and what doesn’t in terms of driving adoption. 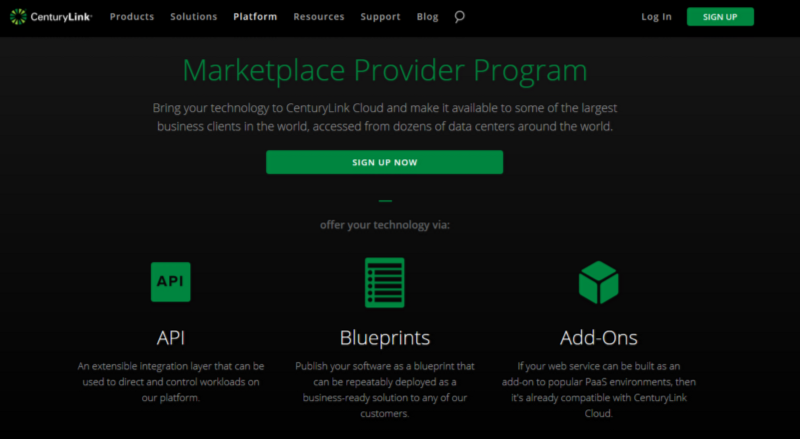 CenturyLink Cloud has been cited by Gartner as a cloud ‘visionary’ and is actively building out a Marketplace Provider Program enabling XaaS innovators to access the CLC customer base. And if it turns out that your best Product/Partner Fit lies with a relatively new marketplace that is focused on building up a critical mass of partner offerings, then choose to see that as an opportunity in which that particular marketplace host may place some additional co-marketing incentives on the table to bring your XaaS innovation into their ecosystem. In other words, Selection is a QoM dimension you can work both ways, and if the Mix of a given marketplace currently favors the marketplace host’s own products, they probably have some extra motivation to diversify as soon as possible. In order to drive organic demand for themselves and their XaaS partners, alpha vendor cloud marketplaces widely embrace popular growthhacking best practices like free test drives, free tiers, and freemium product models. Leading enterprise software vendors now offer free test drives on AWS in order to gain access to the global AWS customer base. 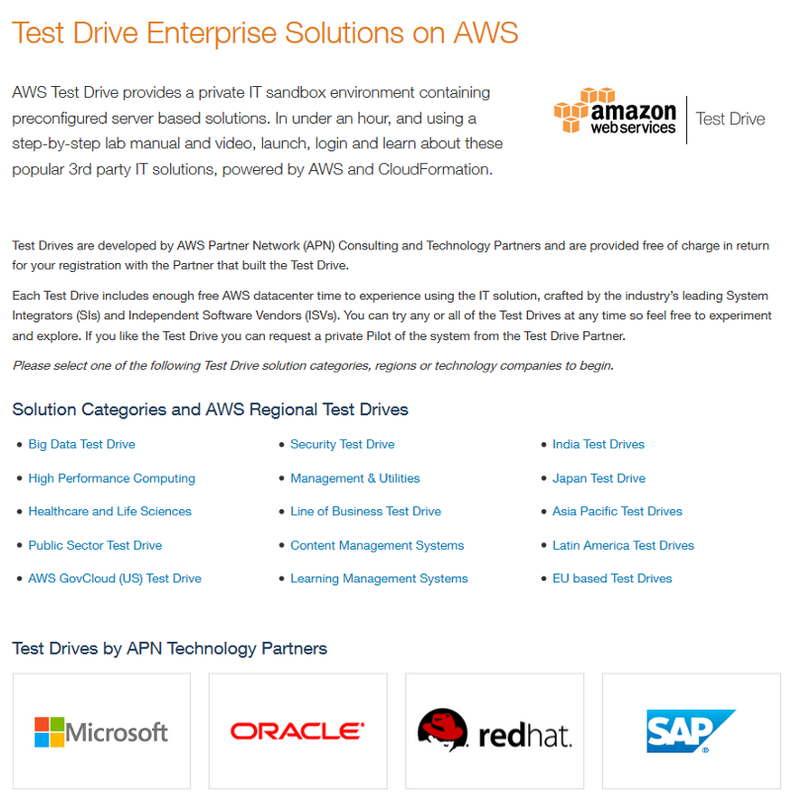 And if there was any doubt about enterprise software superpower incumbents being behind the curve in marketplace streetsmarts, all one needs to do is check out the participation of Microsoft, Oracle,Red Hat and SAP in the Test Drive Enterprise Solutions page on AWS. The software superpowers would be foolish NOT to capitalize on AWS Quality of Marketplace, and expand their customer attach points beyond their own in-place distribution channels. IBM BlueMix PaaS mandates a ‘perpetual free tier’ as a condition of 3rd party partner participation in their marketplace. They are also continuously going to school on AWS Marketplace best practices as they evolve their own partner ecosystems in the age of cloud. 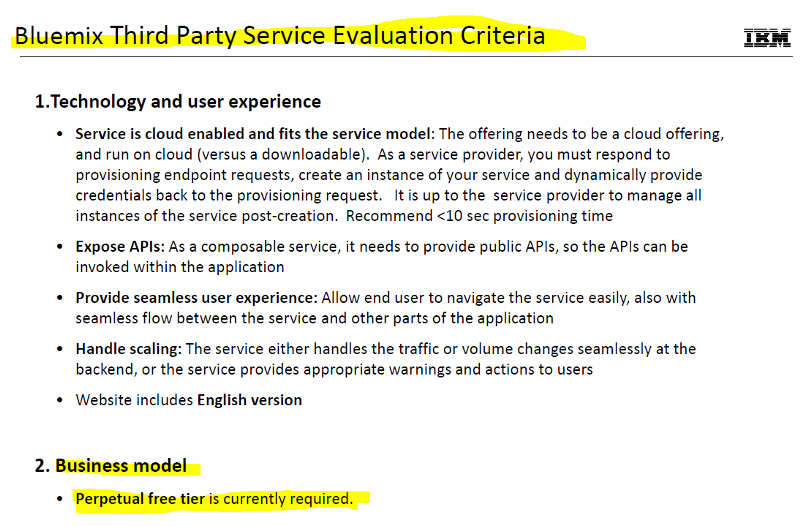 For example, IBM now requires a perpetual ‘free tier’ for all XaaS partners participating in its IBM BlueMix PaaS marketplace. While SaaS companies have CRM innovator Salesforce to thank for pioneering the AppExchange model for app plug-ins and add-ons, it’s the AWS marketplace that took it up a notch in terms of promotional best practices in the age cloud. AWS Marketplace incorporates Amazon’s experience as an online retail & e-commerce superpower. Through its embrace of online retailing, merchandising and e-commerce best practices, the AWS marketplace helps drive demand for XaaS partner offerings. Competing cloud marketplaces and marketplace-as-a-service providers are now standardizing on many of these best practices in cloud services demand generation. 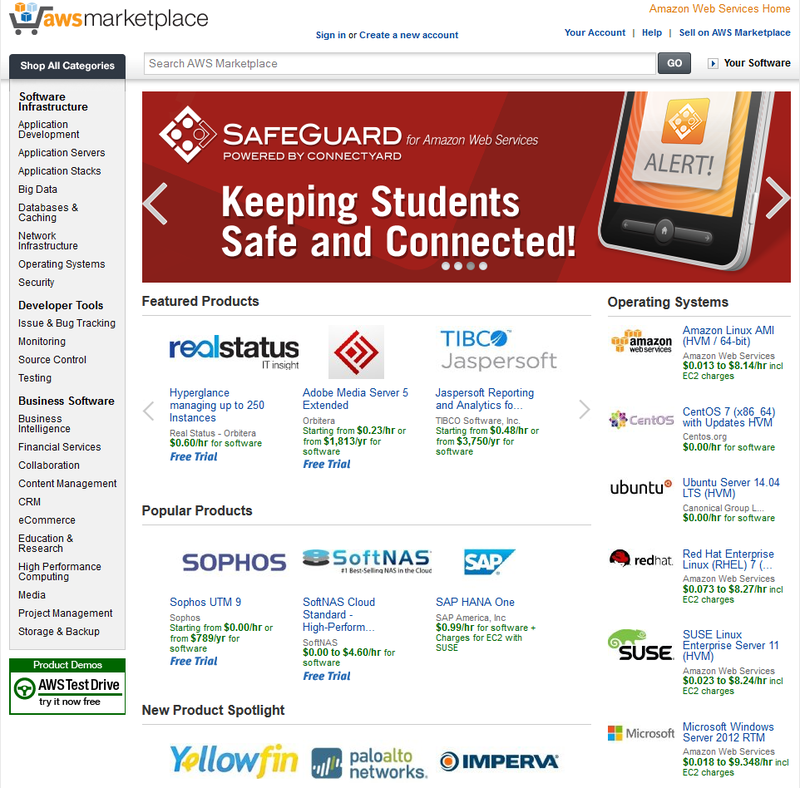 In 2015, XaaS partners gain marketplace home page visibility via Featured, New, Popular, and other showcasing and merchandising mechanisms, e.g. ‘Click to Deploy’ partners— that drive organic traffic to their product pages. Google Compute promoting ‘Click to Deploy’ partners. And this embrace of e-commerce best practices also extends to marketplace partner product pages—Enabling partners to build search-enabled service profiles with rich content and user/customer reviews. Microsoft Azure aggressively promotes the fact that a significant amount of its growth & revenue traction is driven by its partner ecosystem. This is an indicator of Microsoft leadership focus on Quality of Marketplace. Partner & marketplace-driven revenue is increasingly relevant to the cloud superpowers—hence their investments in partner information and support programs designed to drive partner traction in the QoM wars. Alpha cloud marketplace support programs range from “Creating Profitable Business Models on Azure” to Amazon’s Activate program for startups to their Portfolio Package targeting accelerator-backed and seed stage startups. And enterprise IT superpowers are also taking it up a notch and expanding the definition of Quality of Marketplace. 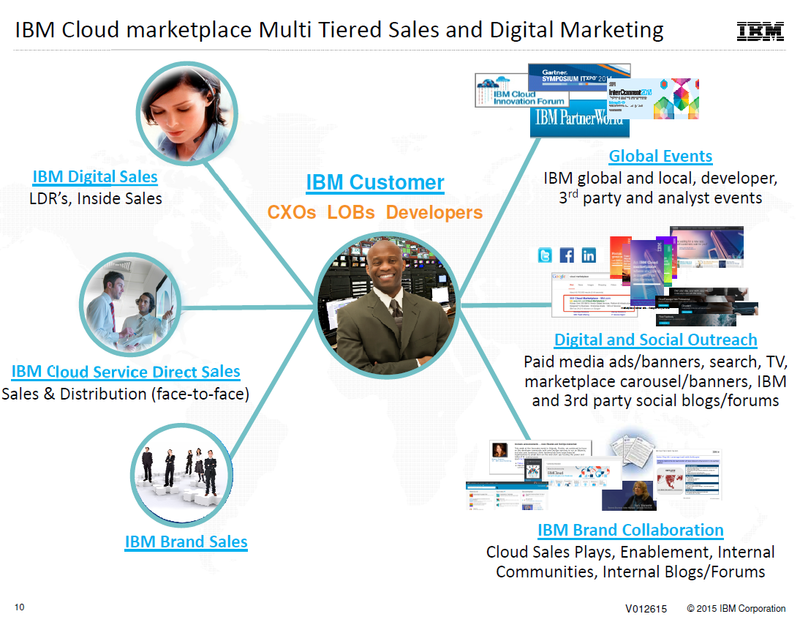 IBM showcases its direct sales team, global events and social channels as part of its overall cloud marketplace value proposition. This is an indicator of a strong ‘Quality of Marketplace’ agenda. 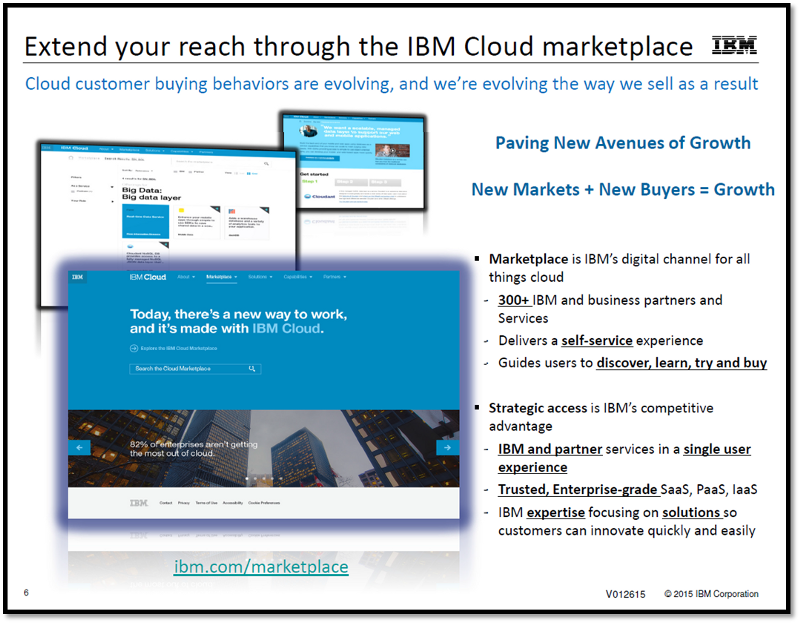 For example, IBM invites its marketplace partners to capitalize on their enterprise installed base footprint by offering access to their cloud sales team and industry event support that leverages these assets and drives opportunity for partners. 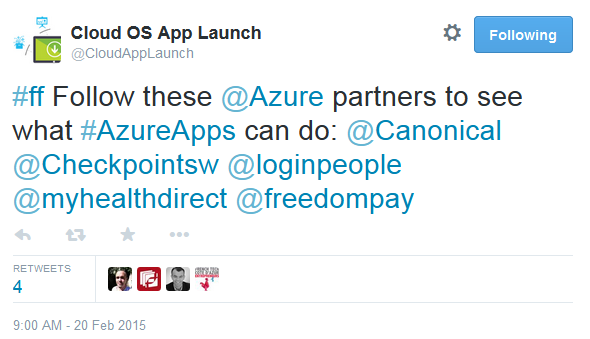 An example of an Azure partner promotional campaign on Twitter. In addition to sales team and event programs, alpha vendor marketplace hosts are becoming increasingly adept at promoting partners on social media channels. Cloud leaders continue to raise the bar in terms of marketplace services. 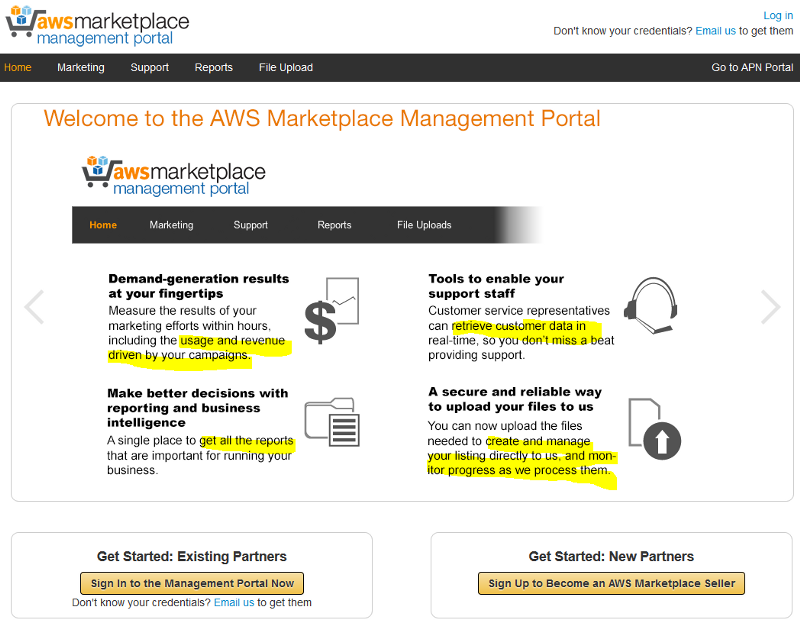 An AWS blog post showcasing their self-service toolset for Marketplace partners. Cloud superpower marketplaces now differentiate themselves from their competition based on the self-service tools they provide to their partners. For example, in the AWS Marketplace Management Portal, partners can access customer service & support, and track and continuously improve the performance of their growth marketing campaigns. They can also create reports by product and by geography and manage the content on their product pages. A web marketing analytics dashboard inside the AWS Marketplace Management Portal enables partners to measure the effectiveness of their growth campaigns. As the number of growth marketing tools expands, look for smart cloud marketplace operators to make them available as a new way of improving their overall Quality of Marketplace. Marketplace as a service providers, e.g. 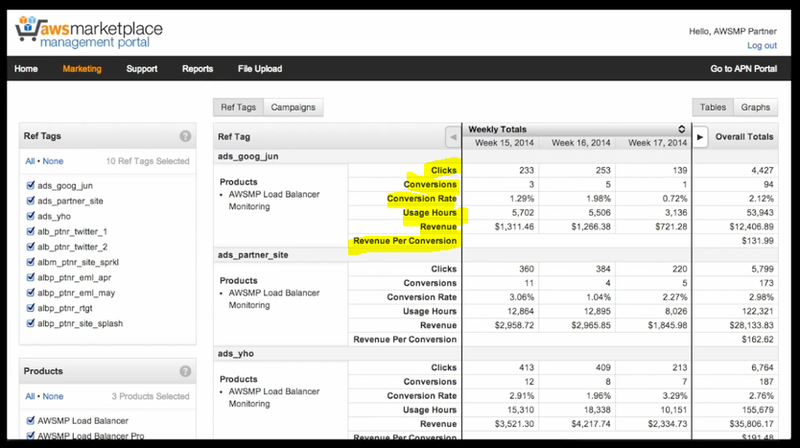 AppDirect, are incorporating marketing functionality into their toolsets. White label marketplace-as-a-service (MaaS) providers are also bringing innovation to the cloud QoM wars. 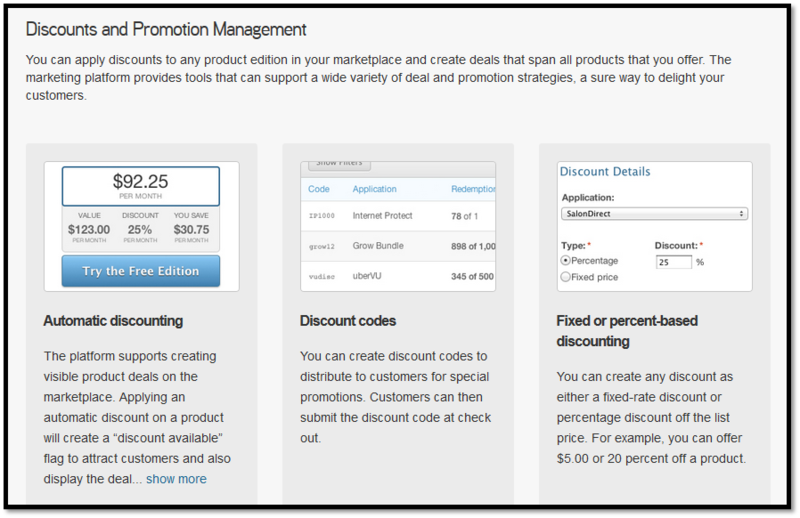 For example, AppDirect’s management toolset enables the creation of special discounting and bundling deals that assist both marketplace operators and XaaS innovators to drive adoption. Marketplace partners rely on their cloud hosts to handle billing for their services. One experience, one invoice, and the host disburses payment. And marketplaces also support direct customer billing by partners that power their SaaS applications or functionality from the host’s cloud. AWS Marketplace handles billing for Amazon Machine Image offerings and a referral fee for SaaS or XaaS offerings in their service catalog. And increasingly, QoM improvement means supporting multiple popular billing models including annual subscriptions for XaaS and SaaS offerings. AWS Marketplace partners can monetize their XaaS offerings via an annual subscription model in addition to the cloud pay-for-use model. By providing monetization model flexibility, alpha cloud marketplaces are enabling their XaaS startup and growth-stage partners to optimize for enterprise and SMB buying patterns, and engage customers in a more agile fashion. And leading marketplace-as-a-service players have now added support for downstream channel partners to participate in cloud marketplace ecosystems. As QoM rivalry intensifies, expect to see more of this kind of multi-layered partner model innovation. True thought leadership and commodity content marketing are different. Commodity content marketing can often end up being all about the ‘ego trip’, i.e. growing the ‘personal brand’ of an individual. True thought leadership is all about the ‘eco trip’, i.e. tackling tough issues and evangelizing product and business practices innovation that grow the overall partner ecosystem and drive more eyeballs and new customers to the partner marketplace. 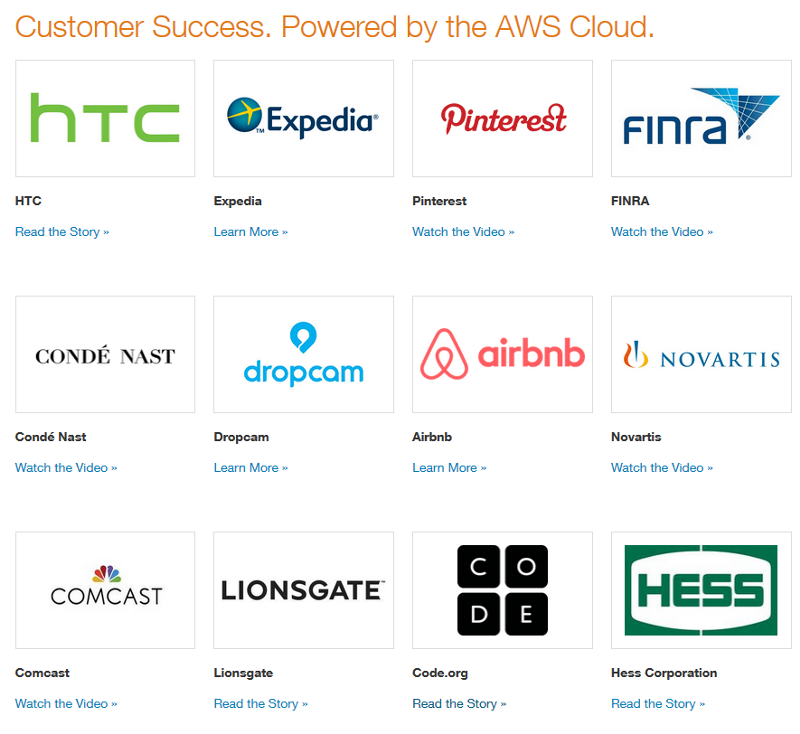 AWS now publishes a startup blog on social content site Medium. Smart cloud marketplace managers also know that developers hate cloud-washed messaging, but pay close attention to rich, high value information—especially when it comes to the next big cloud thing—from containers to PaaS to microservices to 3rd platform digital transformation. For innovators with products in new or emerging XaaS categories, attaching their narrative to alpha cloud blogs, conferences, videos, and other thought leadership centers of gravity can pay big dividends. As 2015 unfolds, look for thought leadership initiatives and fact-based content marketing to become must-have components of alpha cloud vendor Quality of Marketplace improvement. 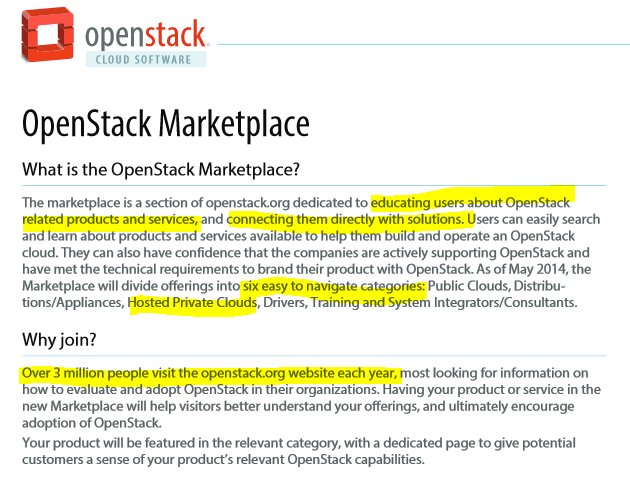 Cloud marketplace hosts provide their partners with multiple deployment options. 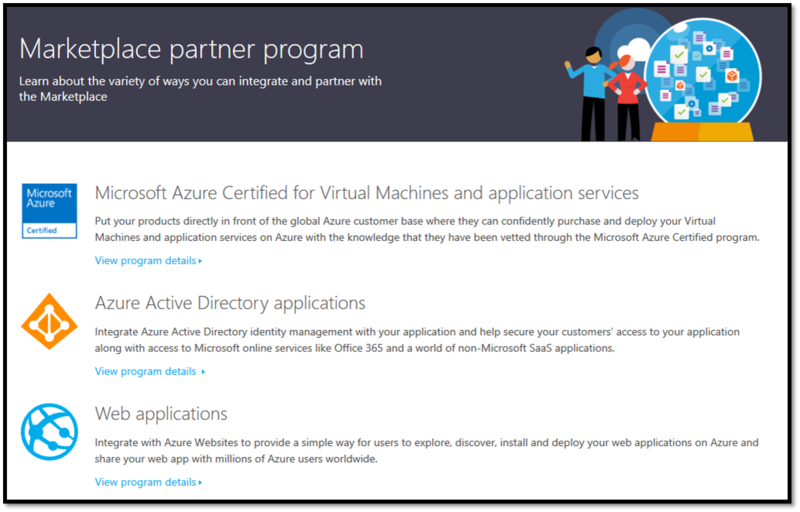 The Microsoft Azure Marketplace enables partners to host and certify their capabilities in multiple ways. From cloud-specific system images that auto-install in 1 click, to XaaS and SaaS add-ons, alpha cloud players from AWS to Azure increasingly embrace multi-modal delivery. And now, high growth cloud open source alliances are rolling out marketplaces with multiple consumption models—from a wide range of downloadable OpenStack distros to a new generation of PCaaS (private cloud as a service) offerings. Among the most important ‘big signals’ XaaS startups need to pay attention to are the ones that let you know QoM really matters to a given alpha cloud player. First and foremost among these big signals is clear and compelling evidence of senior executive focus and attention to ecosystem and marketplace partners. Executive focus manifests in many ways—but it doesn’t get any better than a high profile cloud leader publicly underscoring the importance of partner ecosystem commitment to the growth plans of that company. Executive focus is also in evidence when you see a prominent executive doing double duty as a cloud thought leader, e.g. 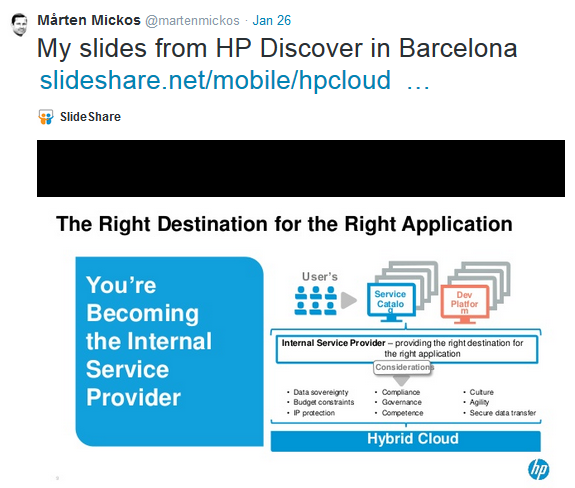 HP’s Marten Mickos articulating a new role for enterprise IT in the age of hybrid cloud—i.e. the ‘internal services provider’. Streetsmart XaaS startups with products that are complementary to this vision know that this kind of executive thought leadership is a clear invitation to directly engage with that executive. Executive focus big signals can also tell you where a cloud superpower is headed in the market, the role of partners in their vision, and the location of various partner ‘attach points’ on the surface of their ecosystem — inviting you into a larger partnering conversation. As Quality of Marketplace moves to the center of cloud vendor competitive strategy, expect to see more high profile executives of the leading cloud players take a hands-on role in evangelizing the value proposition of their respective marketplaces. Those that do will grow like wildfire. Those that don’t operationalize this ‘lead from the front’ mindset will ultimately fall behind. Cloud IaaS & PaaS leaders increasingly differentiate themselves based on Quality of Marketplace or QoM. Through this differentiation, XaaS startups and growth stage players are being presented with an unprecedented opportunity to gain access to alpha cloud customers, growth programs, toolsets, & key executives. XaaS innovators that align themselves with multiple dimensions of QoM are in the best position to capitalize on alpha cloud vendor rivalry in 2015 & beyond. While the growth best practices of marketplace startups remains a hot topic of conversation within the growth marketing community, it’s equally important that XaaS innovators capitalize on the growth prospects presented by alpha cloud vendor marketplaces already in place. By systematically partnering with alpha cloud vendors within their marketplaces—and fine-tuning your product/partner fit within specific marketplaces based on your own creative application of QoM thinking—innovative startups can begin driving affordable, scalable growth in the XaaS economy. Joseph Bentzel is the senior consultant at Platformula Group and the author of “Asymmetric Marketing: Tossing the ‘Chasm’ in the Age of the Software Superpowers” available on Amazon.com. He can be reached by email at joe@platformulagroup.com when your startup or growth stage company is ready to begin capitalizing on Quality of Marketplace (QoM).